The fourth volume in the brilliant Dark Tower Series is splendidly tense rip-roaring (``Publishers Weekly``) a #1 national bestseller about an epic quest to save the universe. In ``Wizard and Glass,`` Stephen King is at his most ebullient sweeping readers up in swells of passion (``Publishers Weekly``) as Roland the Gunslinger, Eddie, Susannah, and Jake survive Blaine the Mono s final crash, only to find themselves stranded in an alternate version of Topeka, Kansas, that has been ravaged by the superflu virus. While following the deserted I-70 toward a distant glass palace, Roland recounts his tragic story about a seaside town called Hambry, where he fell in love with a girl named Susan Delgado, and where he and his old ``tet``-mates Alain and Cuthbert battled the forces of John Farson, the harrier who with a little help from a seeing sphere called Maerlyn s Grapefruit ignited Mid-World s final war. Filled with blazing action (``Booklist``), the fourth installment in the Dark Tower Series whets the appetite for more (``Bangor Daily News``). 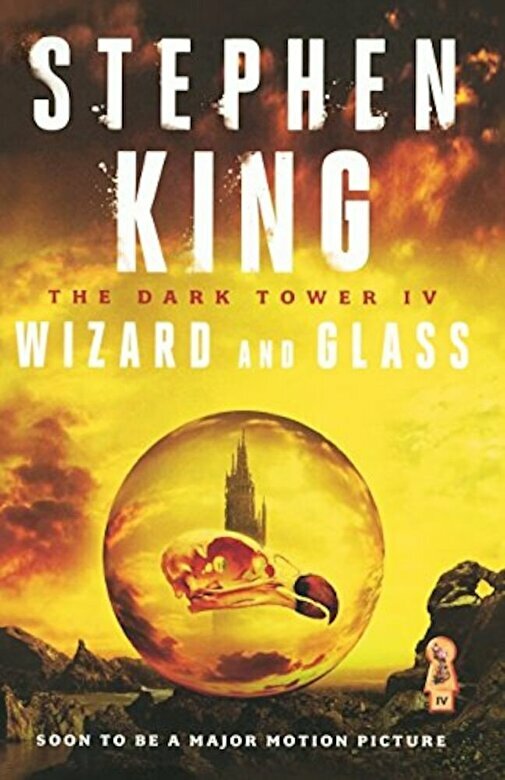 ``Wizard and Glass`` is a thrilling read from the reigning King of American popular literature (``Los Angeles Daily News``).